Why does everything sound better if it's said in French? That fascination is at the heart of The Story of French, the first history of one of the most beautiful languages in the world that was, at one time, the pre-eminent language of literature, science and diplomacy. In a captivating narrative that spans the ages, from Charlemagne to Cirque du Soleil, Jean-Benoît Nadeau and Julie Barlow unravel the mysteries of a language that has maintained its global influence despite the rise of English. As in any good story, The Story of French has spectacular failures, unexpected successes and bears traces of some of history's greatest figures: the tenacity of William the Conqueror, the staunchness of Cardinal Richelieu, and the endurance of the Lewis and Clark expedition. 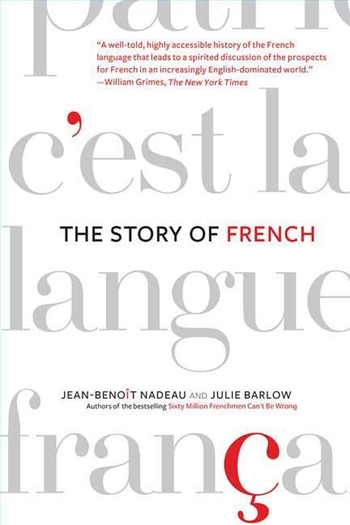 Through this colorful history, Nadeau and Barlow illustrate how French acquired its own peculiar culture, revealing how the culture of the language spread among francophones the world over and yet remains curiously centered in Paris. In fact, French is not only thriving—it still has a surprisingly strong influence on other languages. As lively as it is fascinating, The Story of French challenges long held assumptions about French and shows why it is still the world's other global language. Partners in life and in writing, Canadian journalist-authors JEAN-BENOÎT NADEAU and JULIE BARLOW are award-winning contributors to L'actualité. Their writing has appeared in the Toronto Star, the Ottawa Citizen, Saturday Night, The Christian Science Monitor and the International Herald Tribune, among others. In 2003, Nadeau and Barlow published their critical and popular success, Sixty Million Frenchmen Can't Be Wrong. They live in Montreal.